Situated between the maxilla, sphenoid, and palatine bones. It communicates via canals, fissures, and foramina with various regions of the skull. 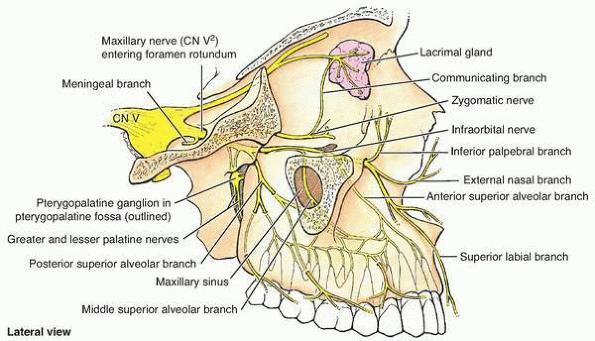 The maxillary division of the trigeminal nerve; and branches of these structures. 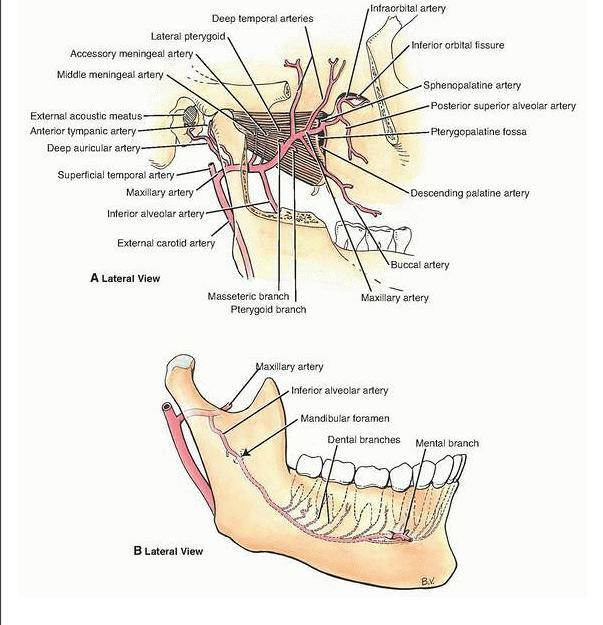 Branches of the pterygopalatine portion of the maxillary artery are the posterosuperior alveolar, infraorbital, greater palatine, pharyngeal, and sphenopalatine arteries as well as the artery of the pterygoid canal. The posterior superior alveolar artery branches from the maxillary artery as that vessel enters the pterygomaxillary fissure. It travels on the maxillary tuberosity and enters the posterior superior alveolar foramen accompanied by the like-named nerve. The vessel ramifies within the maxilla to vascularize the maxillary sinus, molars, and premolars as well as the neighboring gingiva. The infraorbital artery, a continuation of the maxillary artery, enters the orbit through the inferior orbital fissure, lies in the infraorbital groove, leaves the orbit via the infraorbital canal, and enters the face by way of the infraorbital foramen. Branches of the infraorbital artery are the orbital branches, serving the lacrimal gland and the inferior oblique and inferior rectus muscles; the anterior superior alveolar branches, which vascularize the anterior teeth and the maxillary sinus; and the facial branches. The greater palatine artery and its branch, the lesser palatine artery, pass through the pterygopalatine canal and gain entrance to the palate via the greater palatine and lesser palatine foramina, respectively, to vascularize the hard and soft palates as well as associated structures. The pharyngeal branch passes dorsally, through the pharyngeal canal, to vascularize the auditory tube, sphenoidal sinus, and portions of the pharynx. The sphenopalatine artery leaves the pterygopalatine fossa via the sphenopalatine foramen on its medial wall to enter the nasal fossa. The distribution of this vessel and its branches is discussed later in this chapter. The small artery of the pterygoid canal passes through the posterior wall of the pterygopalatine fossa via the pterygoid canal. It supplies part of the auditory tube, pharynx, middle ear, and sphenoidal sinus. The maxillary division of the trigeminal nerve enters the pterygopalatine fossa at its posterior boundary via the foramen rotundum. While in the fossa, it gives off the zygomatic nerve, which, passing into the orbit through the inferior orbital fissure, will bifurcate to form the zygomaticotemporal and zygomaticofacial nerves. The posterior superior alveolar nerves also branch from the maxillary nerve, exit the fossa via the pterygomaxillary fissure, and enter the maxillary tuberosity to serve the maxillary sinus, molars, and adjacent gingiva and cheek. The maxillary nerve then enters the orbit by way of the inferior orbital fissure and is referred to as the infraorbital nerve. While in the pterygopalatine fossa, the maxillary nerve communicates with the pterygopalatine ganglion via two small trunks, the pterygopalatine nerves; however, these nerves do not bear a functional relationship with the ganglion. Postganglionic parasympathetic fibers derived from the ganglion ride along and distribute with branches of the maxillary division of the trigeminal nerve. Orbital branches are slender nerves that supply the periosteum of the orbit and the mucoperiosteum of the ethmoidal and sphenoidal sinuses. 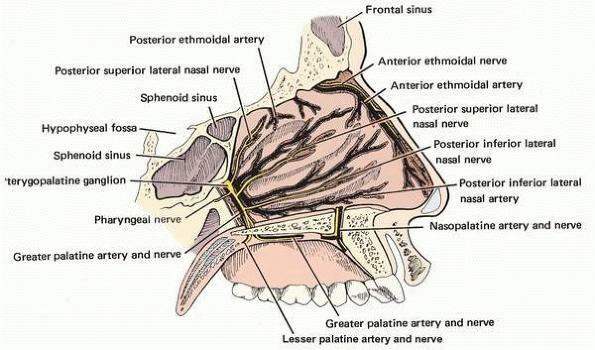 The greater palatine nerve and its branches, the lesser palatine and posterior inferior nasal branches, descend through the pterygopalatine canal to supply regions of the palate, gingiva, tonsil, and lateral wall of the nasal fossa. Posterior superior nasal branches leave the pterygopalatine fossa via the sphenopalatine foramen to serve the posterior aspect of the nasal fossa and part of the ethmoidal sinus. Its nasopalatine branch grooves the vomer bone in its path to the incisive foramen of the anterior hard palate, which it supplies. The pharyngeal nerve traverses the pharyngeal canal to innervate part of the nasopharynx. 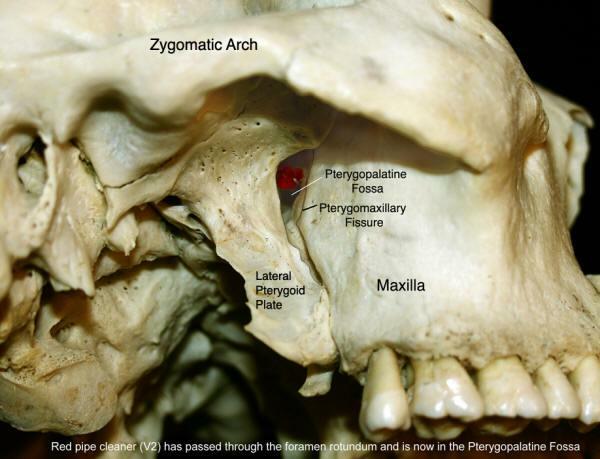 The pterygopalatine ganglion seems to be functionally associated with the maxillary division of the trigeminal nerve because it is suspended by the pterygopalatine nerves within the fossa. It is, however, a parasympathetic ganglion of the facial nerve (cranial nerve VII). This ganglion receives its parasympathetic preganglionic root by way of the pterygoid canal, which opens onto the posterior wall of the fossa. The preganglionic parasympathetic fibers synapse with postganglionic parasympathetic cell bodies within the ganglion. Postsynaptic parasympathetic fibers leave the ganglion and distribute with branches of the maxillary division of cranial nerve V. These fibers are secretomotor in function. They provide parasympathetic flow to the lacrimal gland and mucosal glands of the nasal fossa, palate, and pharynx.